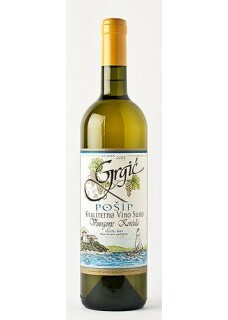 Pošip is an indigenous Croatian variety developed through spontaneous crossing between two varieties from Korčula. This white wine grape variety has been grown for centuries in Croatia on several islands and along the Dalmatian coast, where the cool winds of the Adriatic Sea maintain the perfect temperatures for white grapes. Croatia enjoys a long history of winemaking; records show grapes cultivated here centuries before the birth of Christ. Grapes for this Pošip were grown on the island of Korčula at a small, steep area of vineyards perched above the Adriatic Sea. The just-picked grapes are brought by boat to the winery, just north of the historic walled city, Dubrovnik, in the southern Dalmatian wine region. Fresh and fragrant, offers a trip to the Mediterranean in a glass with citrus, almonds, ripe melon and savory herbs. Notes of apples, vanilla spice and lemon rind on the nose and palate. Dry in style, with penetrating fruit flavors, this has lavish minerality on the midpalate that lends the finish a brisk, crisp feel. Food pairing: Fresh seafood, light cheeses. Grgić Vina was established in 1996 by legendary Napa Valley winemaker, Croatian-born Miljenko “Mike” Grgich, his daughter, Violet Grgić and his nephew Ivo Jeramaz. Dedicated to the art of winemaking, Mike started the winery to produce the finest wines from native Dalmatian grapes, and he concentrates on crafting Croatia’s very best varietals: Plavac Mali (red wine) and Pošip (white wine). The winery is located in Trstenik on the Peljesac peninsula, with a stunning view over the Mediterranean Sea, north of the historic walls of the port of Dubrovnik, in the Southern wine region of Croatia. Although Miljenko has received countless gold medals and the highest possible accolades for his California-made-wines, those dearest and most meaningful to him are the ones he received for his POŠIP and PLAVAC MALI in Croatia. All wines made in at Grgić Vina in Trstenik have been judged to be ''VRHUNSKA VINA'' (top premium wines), and his 1996 PLAVAC MALI has twice been recognized as the BEST red Croatian wine on the market.